By the time, place in a pan and add water just enough to cover the jaggery. Give it a boil and prepare the syrup. Drain the syrup once the jaggery is completely dissolved. Pour back the syrup and boil. Boil the syrup until u reach a single thread consistency. Add in the roasted shredded coconut and mix well . Next throw in the soaked poha and mix well with the thick syrup. Heat the ghee in an another pan and roast the cashews in it. Transfer the contents to the poha mixture and combine well. Stir the mixture until everything comes together ,may be for a couple of minutes and switch off. Add the cardamom powder now and mix thoroughly. Wash the poha in good water and drain almost all the water. Cover it and let it soak for 3 to 4 minutes. Finely crush the jaggery and add 3 tbsp of water and heat until the jaggery gets melted. Filter the sryup and transfer to a seperate bowl. 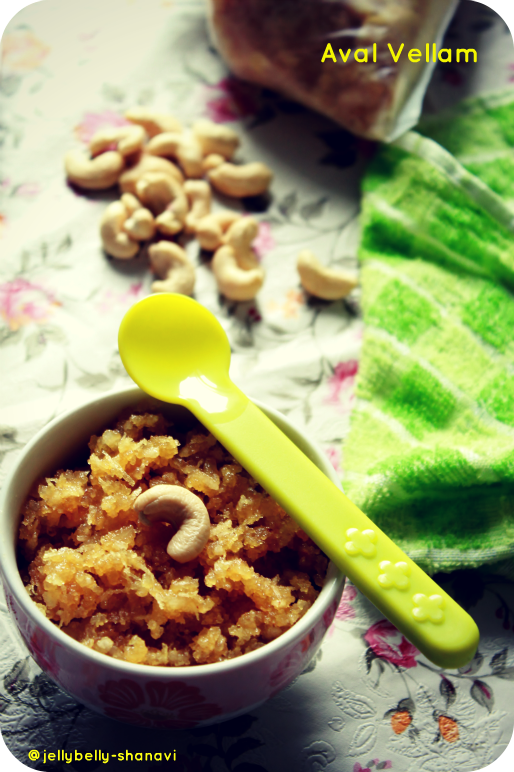 Throw in the shredded coconut, poha to the concentrated syrup and mix well. Add the ghee roasted cashews (optional) and mix well. Cover the bowl with a lid and let it sit for 5 minutes and then serve. 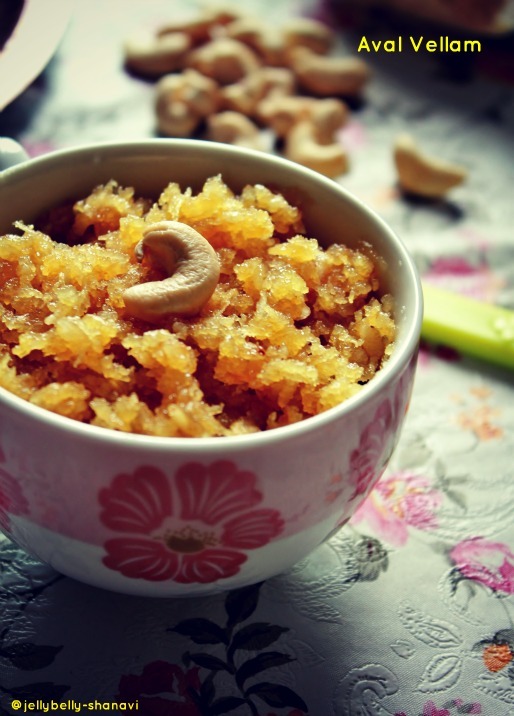 U may add the finely powdered jaggery directly to the poha and coconut and continue the rest for the second method. Wow, never had sweet pohe.. like the twist. Like the click and your space! yummy n tasty one dear..nice pics! Guilt free snack,looks so yummy. very delicious and my favourite too. Seriously cant take my eyes from ur irresistible click,super tempting my favourite aval vellam. We make a similar one but with sugar...This ones even better, tastier..Bookmarked! !